On September 14, 2015 at 09:50:45 UTC advanced LIGO observed GW150914, a chirp of gravitational waves caused by the merging of two stellar-mass black holes. Just 0.4 seconds later, the Fermi gamma ray telescope observed a faint burst of gamma rays lasting about a second. While there is a small chance this is simply due to chance, it looks like the gamma ray burst was triggered by the merging black holes. A gamma ray burst (GRB) is a transient emission of gamma rays typically lasting less than two seconds. On average, about one gamma ray burst occurs every day. They appear randomly in all directions of the sky, and this means they aren’t produced in our galaxy. If they were, then GRBs would mostly be found along the plane of the Milky Way. They are thought to be caused by things like colliding neutron stars, or possibly the capture of a neutron star by a black hole. This particular GRB (named GW150914-GBM) was observed by the Fermi Gamma-ray Burst Monitor, which can observe 70% of the sky at any given time. That’s great for observing these short-lived events, but it means that locating the source of a particular event is a bit imprecise. The most likely location of GW150914-GBM falls within the likely location of the gravity wave source GW150914. There are other aspects of the GRB that would tend to support a simultaneous event. While the burst was faint it had a hard x-ray spectrum, which would seem to rule out known sources within our own galaxy. 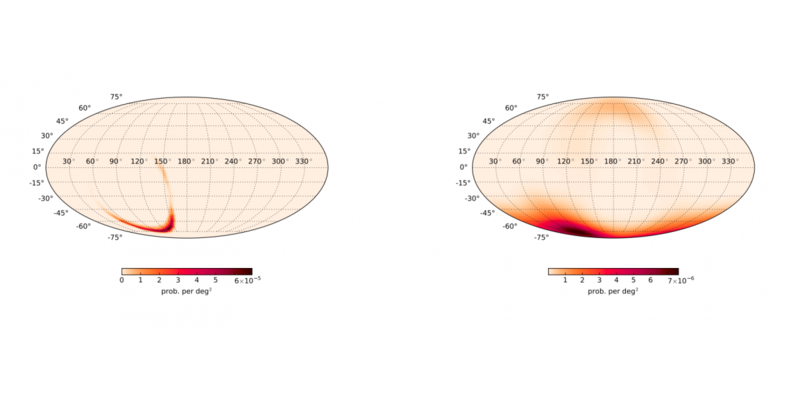 There is still a possibility that some extragalactic event such as the collision of neutron stars just happened to occur in the same general direction 0.4 seconds after the gravitational wave event, but that doesn’t seem likely. Given its faintness there’s also a small chance that this could be a false-alarm. 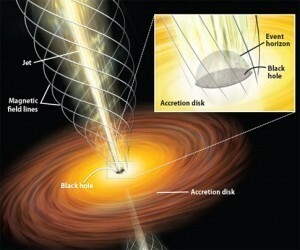 If we assume the two events have the same cause that would mean the burst also occurred 1.3 billion light years away. From its apparent peak brightness we can calculate its peak luminosity. It turns out the peak luminosity of this event is an order of magnitude dimmer than any previous short GRB event. This would support the idea that it was not caused by a neutron star collision. If this GRB was caused by merging black holes, it would be quite surprising. Stellar mass black hole binaries aren’t expected to have a disk of material around them that could emit gamma rays. We’ll need more data to be sure. Fortunately there will be plenty of opportunity to observe similar events over the next few years.